Are you ready for a weak hello, from far away, squeaking imperceptibly from the jaws of the tin-man? Because that’s what it feels like—finding my blogger’s voice after so long. “Sono arrugginita,” I’d say in Italian. I’m rusted. 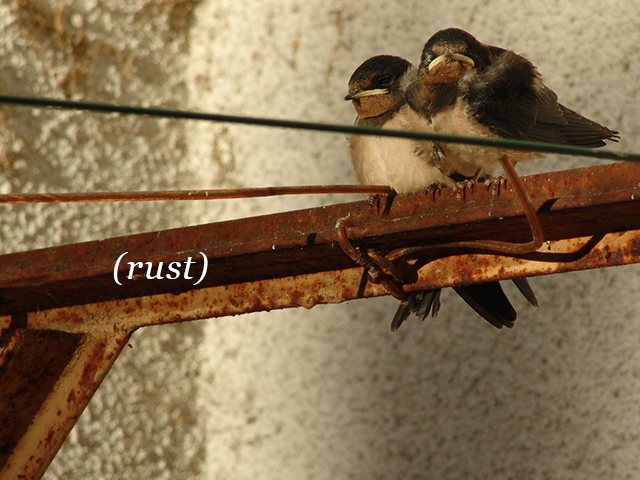 Rusted over. Immobilized by that beautiful crusty stuff that simultaneously gives our lives texture and warmth, while it weakens our strongest beams and monuments. I’ve missed being here, in this space, sharing daily observations and gratitude. I’ve missed finding a reason to check-in and report on the various grazie ricevute. Blessings received. Near misses. Daily wonders and blunders. I’ve missed being in touch with you, hearing your voices. Some other day, I’ll tell you “where” I’ve been. But today I just want to say that the rusty me is being recommissioned. I don’t know exactly how to begin, being rusty as I am. But, there, I already have. And, so, seeing as I’ve started, awkwardly, stiffly, once again to lumber into this world, let it carry on. From this day forward. 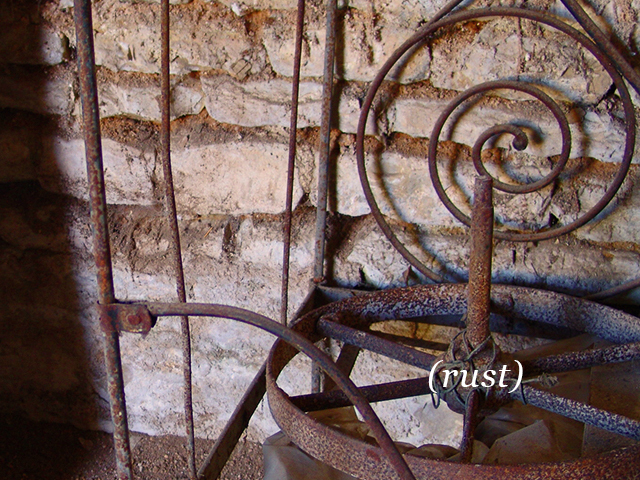 Rust and all. 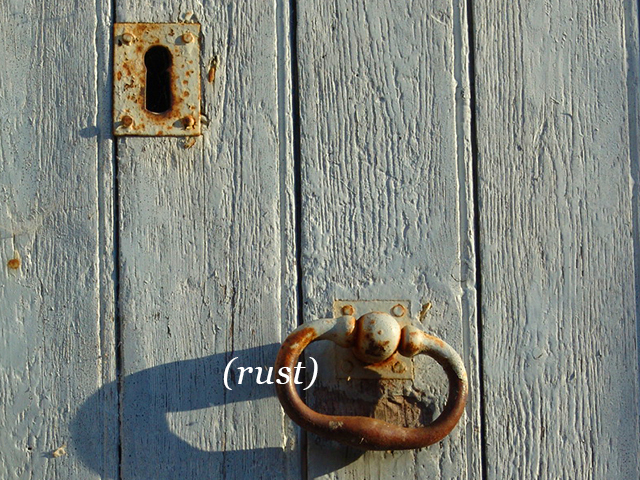 This entry was posted in THEY SAY and tagged arrugginata, blogging, I'm back, rust, rusty. Bookmark the permalink. Thank you ma’am! Don’t know how you do it…every day a fresh word, a fresh eye. Amazing. nice to meet you la la la …..
Boo! How’s the toeless doggy???? So nice to wake up this morning and hear from you with your lovely photos. Look forward to more! Welcome back, Charlotte, you were missed. Some of us were concerned but it seems that it was just life getting in the way. Now, repeat after me, “Oiiiilllll! Ooooiiiilllll!” and we’ll fix you right up. “Oiiiilllll! Ooooiiiilllll!” Hmmm. You’re right. That seemed to work! Missed you. You may have been my nudge to start moving out of my rusty state as well. I’ve been engaging in an internal debate as to how to start. I suppose the answer is to just do it. It’s the only way. Just to start. But maybe you need to be rusty for a while. Is that a possibility? School was over here a couple days ago and with it a massive freelance job, and I have to say, I was hit with a wall of not-wanting-to-do-anything. I’m trying to semi-respect that urge without letting all forward motion go to pot. How’s the running going? Your beautiful post makes me smile. I’m in the mountains of Virginia enjoying an art workshop at Nimrod Hall – built in the 1750’s. Nimrod is full of tin-roofed rust. The birds are singing through a summer rain and I’m not sure but I believe all your pictures were shot right here. Welcome back. It’s good to feel the gentle touch of your eyes, ears, taste and insights. Oh my goodness. I just googled Nimrod Hall…I hate to say I’m jealous, but, yes, I sort of am…good thing jealousy is easily transformed into being happy for others. What are you doing? Will you share when you’re done? I’m going to file Nimrod away for future reference…maybe we’ll meet there some summer. I’m becoming obsessed with your blog. And your catchy way of writing which keeps me wanting to keep scrolling down ;). CHEERS!!! Really glad you like it. Thanks so much. You’re a very good writer yourself. i know how you feel. missed you, glad you’re back, hope you’re well lubed and flexible. (my bike chain could be in your gallery of rusted stuff. sigh…..life and intentions.) maybe i can get loose again soon?